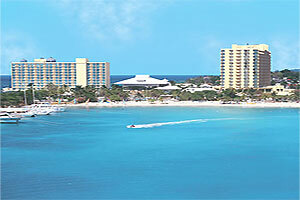 Sunset Jamaica Grande All Inclusive sits on 17 Peninsular Acres On The Eastern Perimeter Of Ocho Rios, Jamaica. This resort is one mile from Shaw Park botanical gardens and two miles from Coyaba botanical gardens. Dunn's river falls, an idyllic tourist destination, is located three miles from this property, as are dolphin encounters at dolphin cove. Hotel features include group activities for adults and children include dance classes, contests and nightly stage shows. Children are invited to join supervised activities in an air- conditioned clubhouse and playground as part of the all inclusive plan, and there is also a toddler's pool. An on-site health spa offers massage, reflexology, body wraps and scrubs, and an air- conditioned fitness center promotes aerobics and yoga.